Disney Baby - Piglet with Jingle Chime. Super soft and cuddly, the Piglet 24cm plush toy is the perfect gift for babies of all ages. Based on the famous character from the classic Disney Movie, The Many Adventures of Winnie-the-Pooh, this cuddly toy is made from the highest quality, textured plush fabric with beautifully embroidered features. 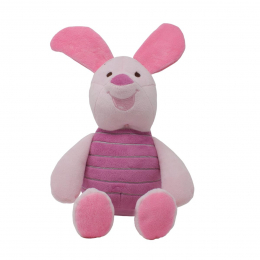 This super soft and super cuddly toy also has crinkle fabric ears and an chime rattle to stimulate baby's senses.